Or how I learned to stop worrying and love the #quick2 (sometimes). When a team is trailing by three late in a game (e.g. less than 30 seconds left), are they better off going for a tie with the three pointer? Or is the superior strategy to attempt a quick, high percentage two point shot, and hoping for a turnover or missed free throws on the ensuing possession? The "quick two" approach draws plenty of derision from my analytics-heavy Twitter feed. Probably because it's emblematic of the conservative, risk averse thinking that mars strategic decisions across a number of sports. Football coaches punt too often on 4th down. Baseball managers still call for the sacrifice bunt, even though it reduces run expectancy. And NBA teams were historically slow to embrace the three point shot. But punts, bunts, and three pointers have all been thoroughly analyzed from a statistical perspective. As far as I know, no one has run the numbers on whether that quick two really is a suboptimal strategy. In this post, I will examine which strategy leads to victory more often. I'll start with teams that trail late by three points, and then look at the same situation, but when trailing by four. For the analysis that follows, I will be using detailed play by play data for the past 10 seasons of NBA games. Outcomes are analyzed by when the team's possession began. Only possessions following a made shot, defensive rebound, or turnover are considered (i.e. quasi-possessions off of an offensive rebound are excluded). When measuring the win percentage of each strategy, if the trailing team forces overtime, I am counting that as half a victory. In theory, whatever happens in overtime is unrelated to the endgame strategy that got you there. This should reduce some of the noise in the sample size. 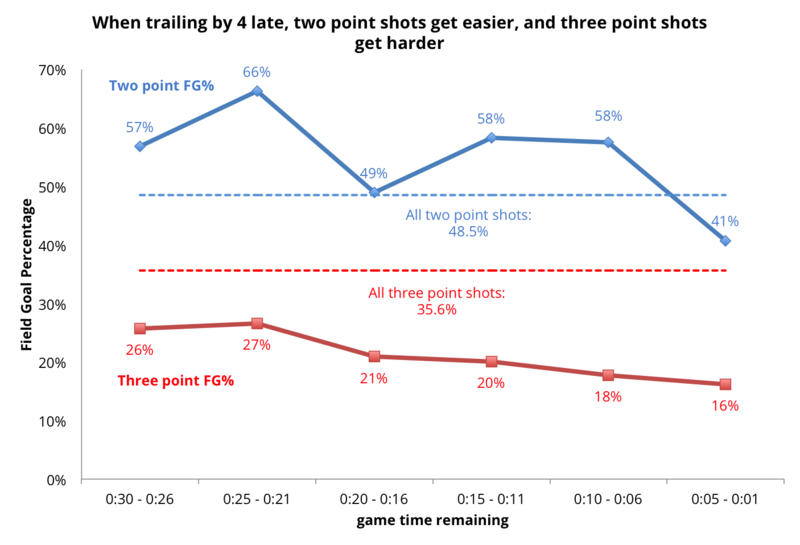 With more than 20 seconds left on the clock, teams are still more likely to attempt a two point shot, but that flips pretty quickly in the final 20. The probability of turnover is fairly constant regardless of start time. Teams are more likely to be sent to the line in the last 10 seconds. "Other" mostly consists of situations in which a team is not able to get a shot off before the clock expires. So, what is the winning strategy? 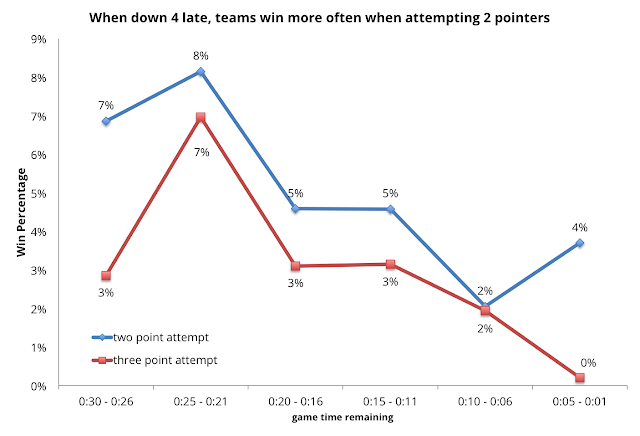 Here is how often teams win when shooting two versus shooting three. For teams that started their possession with 0:25-0:21 left on the clock, those that attempted a three point shot won 17% of the time, while those that attempted a two point shot won just 8% of the time. 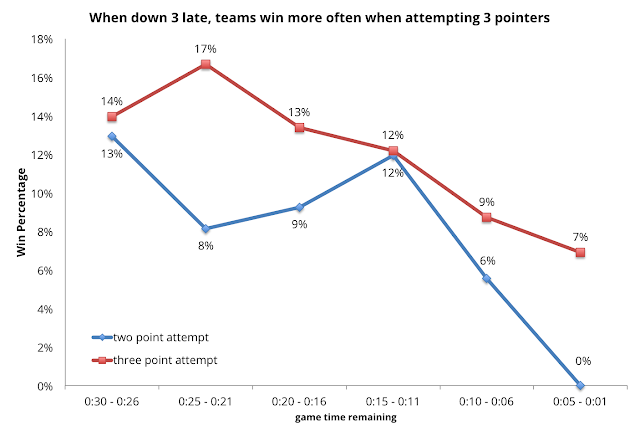 And in general, chances of victory seem to be higher with the three point attempt (though with 0:15-0:11 left, both the two and three point shot led to a 12% win rate). The results, while somewhat choppy, seem to confirm that attempting a three pointer when down three is the better strategy. When it comes to shooting two, I was curious as to how victory was actually achieved in those situations, so I looked at the 11 games in which a team won (either in regulation or OT) when starting possession with 0:15-0:11 left and attempting a two point shot. In all 11 games, the team's two point attempt was successful (not surprising). In four of those games, their opponent hit both free throws following the intentional foul, putting the team in the same spot (down three) but with less time. In all 4 games, the teams then attempted a three pointer to send the game to overtime. In six of those eleven games, their opponent missed one of their free throws, giving the trailing team just a two point deficit to overcome. Four of the games went to overtime with game tying twos, while two were won in regulation on a three point shot. In the remaining game, the trailing team tied the game with a three point play (i.e. an "old fashioned" three pointer). In none of the 11 games was the trailing team able to force a turnover on the possession following the two point attempt. League average field goal percentage on two point shots is 48.5%, but that climbs to 55-65% in late game situations when trailing by three. And three point percentage drops from 35.6% on all attempts to just 15-30% in the same situation. So, even though three pointers get more difficult when down three, they still appear to be the better option. To understand why, we need to understand the incremental value of that third point from a win probability perspective. For a shot attempted with 20 seconds left in the game and down by three, a successful three pointer results in a win probability of 38.3%. A successful two pointer results in a win probability of 19.0%. And a missed shot drops you to 5.0% win probability. So, the marginal win probability value of a successful two point shot, relative to a miss, is 14.0%. But the marginal value of a successful three point shot is 33.3%. In other words, a successful three pointer is 2.4 times as valuable in this situation as a successful two. Or put yet another way, if you had a three point shot with an expected success rate of 25%, a two pointer would need to have at least a 60% or better chance of going in to be the better option. So, when down by three, both the raw data as well as theory (i.e. 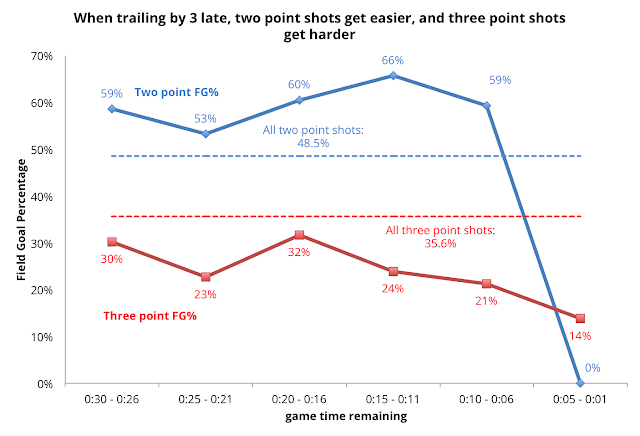 win probability) seem to favor shooting three pointers when down by three late in the game. So, in this situation, perhaps Twitter is justified in their ridicule of the #quick2. But let's now turn to the situation when a team is down by four. When compared to the "down three" table, the split between two point and three point shot attempts seems to be biased more towards two pointers rather than threes. Victories are rare under either approach, but when trailing by four, attempting a two point shot actually looks like the better option. The marginal value of two points is 6.8% in win probability, while the marginal value of three points is 17.2%, making the successful three pointer 2.6 times more valuable than the successful two. None of this analysis should be construed as endorsement of a single endgame strategy. Strategy and shot selection will be driven as much by what the defense gives you. If you have an opportunity to take an uncontested corner three when down by four, that is probably the better option, regardless of what my charts above say. And if you are down by three and your outside shooters have been locked down, driving into a soft interior defense could just as well be the best approach. But what the above gives you is at least a set of historical benchmarks to start from.